Georgia Tech beat us and Mississippi Southern tied us last year, and Texas beat us after we had the game won. We only played about five games the way we were capable of playing and lost one of those. I hope to get out before they start football next year. I want to make sure I don’t interfere with the success of that team next year. I don’t see any way I could go to practice like most of ’em do, and not hurt the team. I’d go nuts if I tried doing that. Back 12 years ago, when Dr. Mathews was president here, we had a plan that when I got ready to quit, we’d bring a certain guy in and he’d take over that day and I’d leave. But as time wore on, I realized that wouldn’t have been good at all. I can remember loving to recruit. I knew I was going to do my best. But traveling and recruiting doesn’t appeal to me any more. It’s not as much fun as it used to be. I didn’t have a thing to do with picking a coach, and didn’t want to. But I didn’t think they’d pick one I didn’t like. I think I’m telling the truth. I sat by Ray Perkins at the Hall of Fame dinner in New York, and at that time he didn’t know he was our coach and I didn’t either. I plan on staying at Alabama for the rest of my career. I guarantee that I’ll be here for you through it all, regardless of what happens. I’ve had many a player tell me all through high school and right up until signing day that they were coming to Alabama, then they signed with somebody else. I’m happy with the coach we have. I think any one of the ones I asked them to consider would’ve been good. Nearly every coach I’ve talked with tells me that the attention you get from media and other people is the thing you miss most. I don’t know if that’s right. Never quit. It is the easiest cop-out in the world. Set a goal and don’t quit until you attain it. When you do attain it, set another goal, and don’t quit until you reach it. Never quit. I’ll put you through hell, but at the end of it all we’ll be champions. It’s been years since I’ve had a real input in the game anyway. For this game, I’ve just tried to keep all the other stuff away from the players and coaches. If I miss coaching that much, I could go to some little school where they didn’t recruit, where all the kids wanted to go. I believe I could find somewhere to coach. If we’d beaten ’em, I wouldn’t be going out. 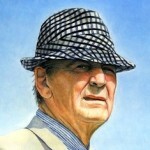 Bear Bryant was an American college football player and coach. He was best known as the longtime head coach of the University of Alabama football team. During his 25-year tenure as Alabama's head coach, he amassed six national championships and thirteen conference championships. Upon his retirement in 1982, he held the record for most wins as head coach in collegiate football history with 323 wins. At the University of Alabama, the Paul W. Bryant Museum, Paul W. Bryant Hall, Paul W. Bryant Drive and Bryant–Denny Stadium are all named in his honor. He was also known for his trademark black and white houndstooth or gingham hat, deep voice, casually leaning up against the goal post during pre-game warmups, and frequently holding his rolled-up game plan while on the sidelines. Before arriving at Alabama, Bryant was head football coach at the University of Maryland, the University of Kentucky, and Texas A&M University.